The layout of these pages is currently explained on the UK Wildlife homepage. More commonly reffered to simply as the Swallow, this bird is very notable in the UK having the distinct features of curved and pointed wings and a two-tipped pointed tail. It is a summer visitor to the UK arriving in March and leaving around October. Schools set in rural and semi-rural locations are more likely to find these birds as they prefer open countryside for nesting and feeding. 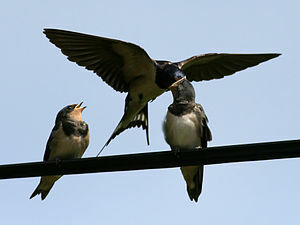 A local water source would increase the chance of locating Swallows as they are often found feeding over water as well as collecting wet mud for nesting. Asia: excluding Siberia and Arabian Gulf. Africa: All countries south of Central African Republic. North America: excluding Alaska, Greenland, Caribbean and Northern Canada. South America: excluding southern Argentina and Chile. Topics currently covered – variation, evolution, seasons, spring, poetry, Shakespeare. In the UK we simply refer to this bird as the Swallow since it is the only species with a range covering the United Kingdom. There are 6 subspecies of the Barn Swallow that vary slightly, most notable with the North American subspecies having a much redder underbelly. If you need quick information accessible to children for a lesson or bird-spotting, the RSPB have an excellent resource: Barn Swallow Fact File. Variation – The 6 subspecies would make for a good lesson on either variation or, it being in the draft curriculum, evolution. Although they are the same species, they have slight variations which can be compared to variations in humans (again the same species) and contrasted with their close relatives, the martins (House Martin and Sand Martins found in similar environments within the UK). Seasons – Swallows have been used as a signal of the approaching summer throughout history and could be used in any work on seasons, whether it be poetry, descriptive writing or science. They appear earlier than other migratory species such as the Swift. Shakespeare – Many of his works feature the Swallow as a reference to speed and an approaching summer. Richard III, The Winters tale and Titus Andronicus all feature the Swallow. If you would like any advice on linking this species to a particular subject/topic please get in touch here.